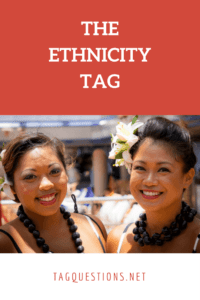 The Ethnicity tag is a list of six questions that help you understand a person’s culture and country of origin. Let’s face it, if you are in a foreign country, chances are people would be unintentionally offensive to you a couple of times. Sometimes, this might even extend to – Unintentional Racism. Unintentional racism occurs when someone acts in a way that seems fine to them but is offensive to someone from another race. So, if you are from a different culture, this simple fun game can help you educate your friends about your ethnicity. The following questions are the simple questions you need to answer for the ethnicity tag. When was the last time you visited your country? Name one ethnic food you enjoy the most. Name one household item that best represents your culture. What part of your country are you from? What song reminds you of your country? As with other tags, there are a couple of versions of the nationality/ethnicity tag but they all achieve the same purpose. Here is another version of the ethnicity question tag with 2 extra questions but like I said – they all achieve the same purpose. Do you have an ethnic name? What part of the country are you and your family from? Name one ethnic food that you enjoy the most. What is your favourite ethnic music? It would be pointless to talk about the ethnicity tag without showing you a video of the fun tag. Here are some fun ethnicity/nationality tag videos. Popular YouTubers Yals and Hals finally put to bed questions surrounding their nationality by taking the ethnicity question tag. Watch Love Halssa answer the nationality tag question on her own YouTube channel. Bethel uses the tag to educate her subscribers on her ethnicity. As you can see, it is a fun and simple way to educate yourself or educate someone on your ethnicity. So, why don’t you go ahead and make your own video?